As a famous rock singer once crooned, “Two out of three ain’t bad,” Well, two out of two is better, and that’s what we’ve just achieved with our client the Capita O2 Partnership. Last night they won the Best Outsourcing Partnership category at the CCA Global Excellence Awards, beating seven other finalists (including fellow outsourcing industry heavyweights Serco) to take to the stage. Only last week they had their glad rags on at the National Outsourcing Association Awards and won the Best Offshoring Project category. The Capita O2 Partnership was formed in 2013 and broke the mould for the industry, being a 10 year agreement which delivers all of O2’s customer service. We’ve been delighted to provide our expertise to the NHS, having been commissioned to author a guide to writing winning award entries. NHS Employers has published the guide this month (July). It is aimed at NHS communications teams with the ability and resource to write their own awards, and draws on our years of experience of helping clients to success. The guide will be supported by a half-day training course for communications officers. 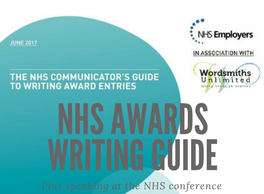 The guide – The NHS communicator’s guide to writing award entries – sets awards in a strategic context, helping organisations with limited resources make decisions about whether entering awards is the right thing to focus on. It also provides a comprehensive structure for putting together quality award entries.